Our 12-year old refrigerator’s ice-maker went out and we decided it’s time for a new one. Although this is the first time we’ve had to shop for a refrigerator, I know that today’s options are much different than 12 years ago. Instead of choosing just between french door or top freezer, now we have touch-panels, interactive displays for calendars, voice-control for shopping, inside cameras for inventory tracking and other features. Most of these features are enticing and I like the idea of opening an app to view what’s in my fridge but, most were just out of our budget. However, with a show-room model discount we went with a GE (Model CYE22USHSS). Although simpler than some, this beauty still has: an LCD display that we now have our family slide-shows on, I can remotely monitor if the door is open/closed/temperature/etc., and it integrates with my echo dot so I can tell it to start brewing hot water to use with its built-in Keurig dispenser. I wanted to keep it simple and aside from the Keurig dispenser, I wasn’t even aware of these features until after they delivered it to our home. Once installed, it prompted me to connect to our WiFi and away we went…now in the year 2017. Not that me getting a new kitchen appliance is much of any news, but it’s astounding how technology evolves everywhere. 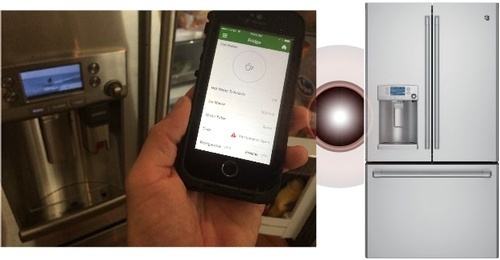 Just to mention(again) that my refrigerator now communicates through WiFi and my audio/video/Alexa house system, is pretty cool stuff but no… we aren’t selling refrigerators yet. Oh and yes, the picture on the fridge-slideshow pictured above is me surfing with my 1 year old from two years ago, stoked to share here :).